After moving on from the overlook the fog finally starts to burn off. It would get progressively clearer throughout the remainder of the hike. 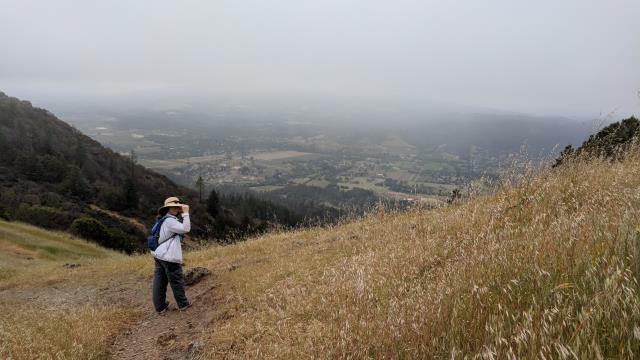 101 Hikes in Northern California encompasses the full spectrum of the region’s incredible natural diversitythe jagged granite of the High Sierra, crashing surf of the Pacific Coast, magnificent redwoods of the North Coast, spectacular views of the Bay Area, and much more. All trips have been thoroughly updated for the second edition, and 26 trips have been significantly expanded or reworked. Each hike description includes an easy-to-use header outlining the trip basics, driving directions, an in-depth trail description, up-to-date map, and the locations of the nearest visitor center and campground.